Looking for an easy, make-ahead appetizer? 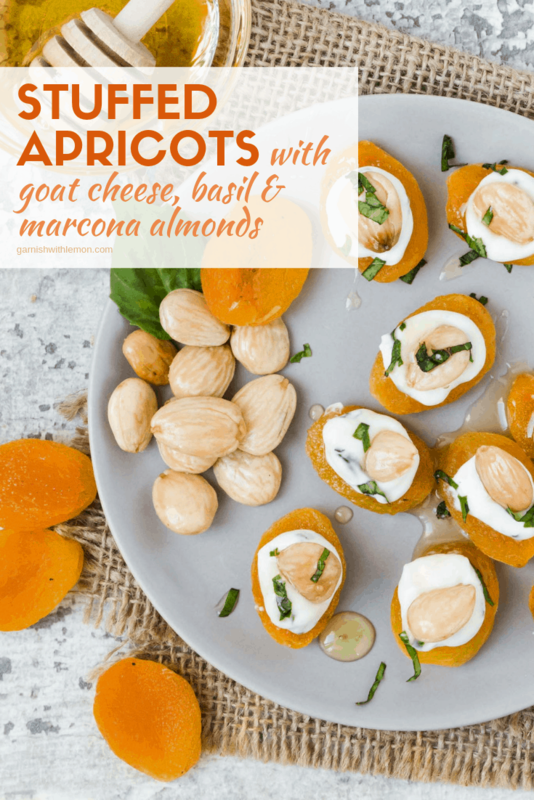 These Stuffed Apricots with Goat Cheese, Basil and Marcona Almonds come together quickly and are gorgeous on your appetizer table. In our world it’s always party season, but that doesn’t mean that the appetizer you bring to share has to be calorie ridden. 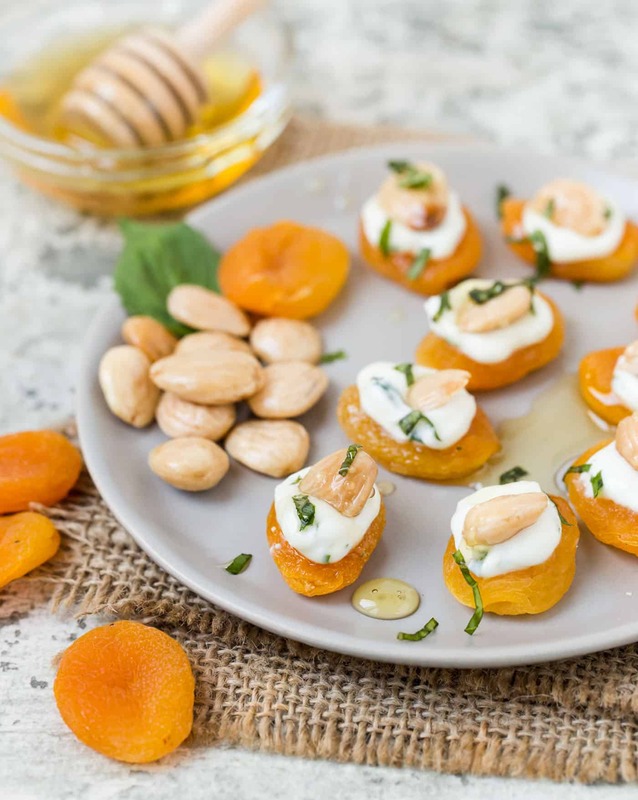 I was on a girls’ weekend and one of my friends brought these yummy Stuffed Apricots with Goat Cheese, Basil and Marcona Almonds. Um, Y-U-M. Why haven’t I had these before? But don’t worry, I’ll share them with you, too, so you enjoy these delicious little gems. And I dare you to pop just one in your mouth. Make sure your goat cheese is room temperature before you mix it with the milk for an ultra creamy texture. Place the cheese mixture in a small plastic bag and snip the corner to pipe on top of the apricots. No fancy piping bags required! Boom. The hardest part is done. How easy was that? 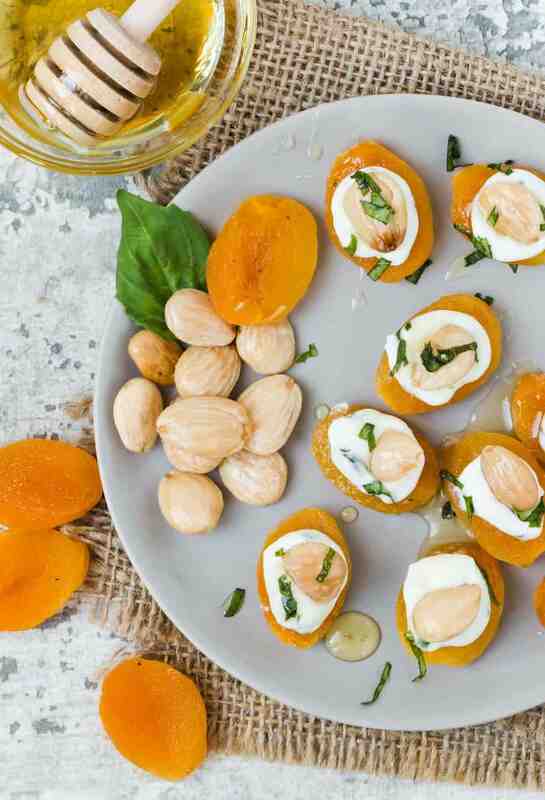 These Stuffed Apricots with Goat Cheese, Basil and Marcona Almonds are made with dried apricots and come together in 5 minutes. Plus they taste best at room temperature. Another bonus? They are really pretty and add some fresh flavors to the mix of typically heavy party fare. What’s not to love? You might have seen these irresistible little nuts on meat and cheese trays. Marcona Almonds hail from Spain and are rounder, softer and sweeter than a California almond. They are typically roasted in oil and sprinkled with sea salt. Sooooo good!! They are the perfect topper to these dried Stuffed Apricots. So I need dried apricots for this appetizer recipe. What is the difference between Turkish apricots and California apricots? Not a lot. Turkish apricots are a little sweeter than California apricots, but either works in this recipe. I used California Apricots when I made these. They are a little tangier than Turkish Apricots and pair perfectly with the goat cheese. And when you stick a salty Marcona Almond on top, sprinkle with some fresh basil and drizzle with a little honey, it’s pretty much perfection on a plate. Take these little stuffed apricots to any party and watch them fly off the plate. I know the cheese doesn’t make them super low calorie (and eating 10 instead of 2 or 3 isn’t the best example of portion control), but it’s fruit, right? And it’s still a party. Apricots don’t get the love they deserve. Help spread the love with some of our favorite ways to eat them. Mix goat cheese and milk together in a small bowl until smooth. Add 2 tablespoons of the basil, season with pepper to taste and mix well. Spoon or pipe a small amount of the goat cheese mixture on top of each dried apricot. Place Marcona almond on top. Sprinkle plate with remaining basil and serve. This is my type of party food!! YUM!! Thanks, Liz! Happy New Year! Love these! This is one appetizer where I lose all will power and self control around. I love dried apricots and cannot wait to try this delightful combination! !